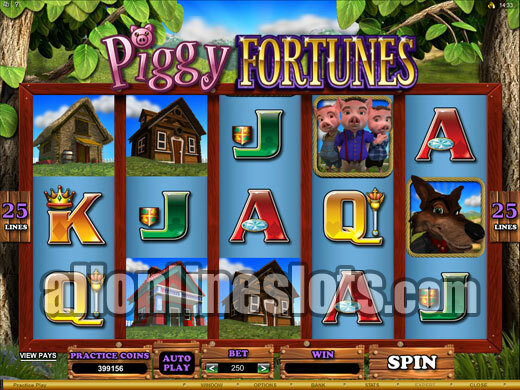 Piggy Fortunes is a 25 line slot machine with a theme based on the Three Little Pigs fable. The game features a top line win of 2,500 coins and a unique free spin feature where the spins continue until the houses are blown down. Piggy Fortune is a 5 reel, 25 line slot machine from Microgaming. 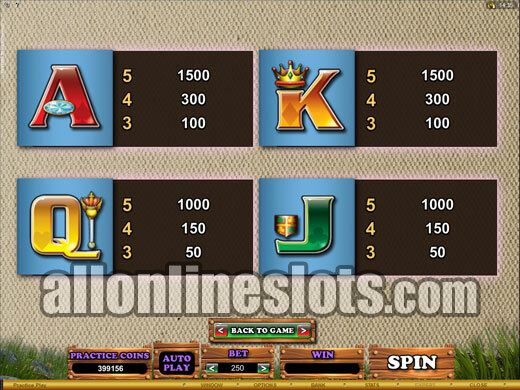 The game is based on the Three Little Pigs fable and features a Big Bad Wolf free spins bonus. Top line win is 2,500 coins and you can bet between 1 and 15 coins per line. Coin sizes at most casinos range from 0.01 to 0.20 with a max bet range of between 3.75 and 75.00. The Big Bad Wolf symbol is wild and substitutes for everything except the Three Little Pigs scatter symbol. Oddly there is no specific payout for the five wild Wolf symbols so getting five defaults to the highest line win which is 900 coins for the five Brick houses. This can pay up to 13,500 coins if you're playing max bet. After the highest line win of 900 coins the next highest line wins are 600 coins for five Wood houses and 300 coins for five Straw houses. From there the five of a kind wins come in at between 150 and 100 coins. Again all of these wins are at the one coin level so if you bet more you win multiples of these awards. The games highest jackpot of 2,500 coins is won by hitting five of the scattered Three Little Pigs symbols. At max bet this awards 37,500 coins which is the biggest possible win available during regular play. 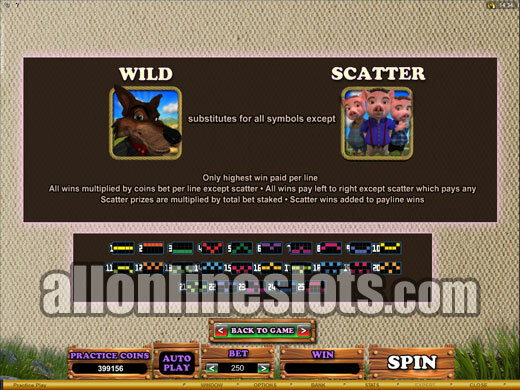 Getting three or more of the scatter symbols awards the Big Bad Wolf free spins bonus. Once triggered the free spins begin and you have three houses standing. Instead of getting a set amount of free games the Big Bad Wolf determines how many games you get. Every time a Wolf appears adjacent to a house all houses of that type are blown down. The free spins end when all three house types are blown down. Getting three or more scatters during the free spins rebuild one of the house types which increases the amount of free spins you will get. As well as blowing down the houses the Big Bad Wolf is also the key to the biggest wins that Piggy Fortunes offers. During the free spins the Wolf acts as a multiplier when certain houses are blown down. When the Straw house is blown down the Wolf awards a X2 multiplier. When the Wood house is blown down the Wold multiplies wins by X3 and when the Brick house is blown down the multiplier grows to 4X. 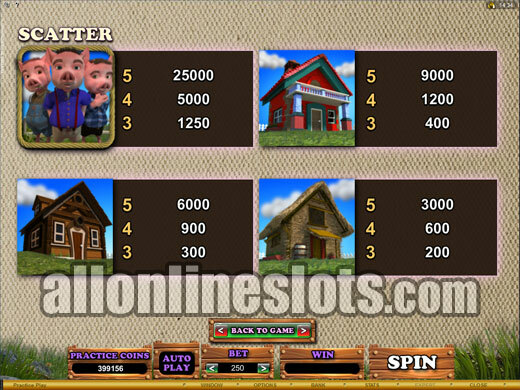 With the highest multiplier it is possible to win 54,000 coins if you line up the five Brick houses with at least one wild and you are betting max. As the Wolf does not multiply the Three Little Pig scatter symbols the pay for five scatters remains 37,500 coins. In the end, Piggy Fortunes offers a different style of game play compared to most free spin slots. This is a bit of a double edged sword as you can get as little as three free spins if you're unlucky. 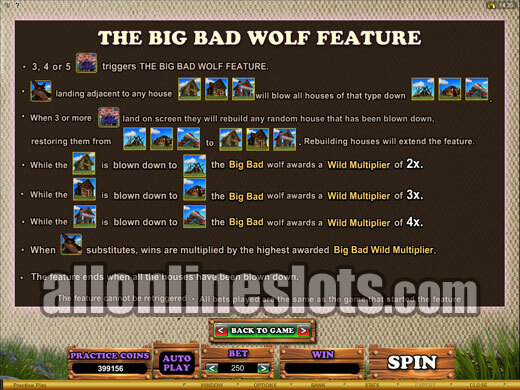 On the other hand you can get a whole lot of free spins if you manage to keep the Big Bad Wolf at bay.